Experience our large cabins in Pigeon Forge and Gatlinburg, TN! Cabins USA offers these cabins for big groups with a big discount to help you save on your vacation! These large cabin rentals are just the right size for groups planning family reunions, church retreats, weddings, and business retreats. Many of these mountain lodges can accommodate over 20 guests with plenty of space. Both Pigeon Forge and Gatlinburg are perfect destinations for big groups! Whether you're visiting Dollywood with a youth group, competing in a tournament at the Cal Ripken Experience, or attending an event at the LeConte Convention Center, these big 6-bedroom, 7-bedroom, and 8-bedroom cabins are bound to make your stay a delight! Need even more space? Use our multiple cabins booking tool! 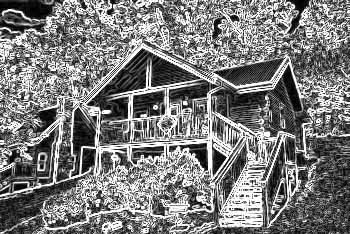 This feature helps you find several multiple cabins in the same area of the Smoky Mountains! Check our group cabins availability today to find the right fit for your vacation in the Smoky Mountains. See how much you can save with our special 15% discount! These first-rate cabin amenities ensure that your group, family reunion, conference group, or retreat enjoys the Smoky Mountains in comfort and style. Additionally, we offer cabins with swimming pool access that provide summertime fun. Inside, guests can enjoy friendly competition in Pigeon Forge cabins with pool tables. With such ample space, your family members can enjoy each other's company with comfort. Pigeon Forge cabins with game rooms and with Pigeon Forge cabin rental theater rooms allow you and your family to have plenty of fun in your cabin! If your group is in need of smaller accommodations, explore our family cabin rentals in Pigeon Forge for your family vacation. If these cabins aren't large enough for your planned celebration, Cabins USA would be glad to help by directing you towards groups of large cabins that are easy to rent to accommodate even larger groups and occasions.